Tesla can stand up to big-name automakers, but it needs to make improvements before they have a plethora of competition on the road. Increasing global trade tensions continue to weigh on U.S. equities, starting the week off with a big selloff. On Monday, the Nasdaq, S&P 500 and Dow Jones each fell about 2% and are posting a tepid bounce so far on Tuesday. For Tesla Inc.'s (TSLA - Get Report) part, shares are still teetering on a very important technical level, and actually held up pretty well in Monday's trading session despite the selloff. So far in Tuesday's trading session, shares are about flat. But looking beyond the hour-by-hour trading ticks, what does Tesla's future hold? 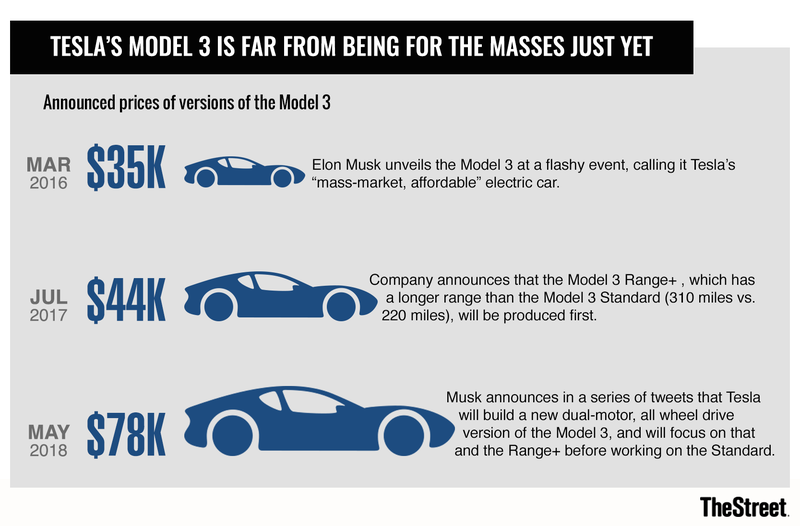 While we don't know if the automaker will be able to sustainably produce 5,000 Model 3s per week or eventually scale up to the 10,000 units a week mark, we do know that competition is set to increase. We've heard it all year long, too. At the 2018 Detroit Auto Show, Bentley CEO Mark Del Rosso told me that the electrification trend is only going to gain traction going forward. That's become crystal clear as seemingly everyone from General Motors Co (GM - Get Report) and Toyota Motor Corp. (TM - Get Report) to Aston Martin and Lamborghini are working on electric and hybrid options for their customers. Naturally, the competition is increasing in a big way for Tesla, and the automaker will need to cement itself in the automotive industry of the future to avoid being pushed out completely. Tesla's battery technology is second to none and it's very much a leader in this respect. In fact, much of Tesla's qualities come on the technological side, whereas its shortcomings have been in manufacturing and long turnaround times. On the plus side, these things can be fixed -- and the sooner the better. The Model 3 will start having more competition, with GM management saying they will boost production of the Bolt thanks to elevated global demand. Further, the company plans to launch 20 new electric models by 2023. Mercedes is in on the mix, too, saying it plans to launch 10 by 2022. We just took a closer look at the Porsche Taycan, a very real potential competitor to the Model S.
And no, this isn't saying that Tesla is dead in the water now that the big boys are getting in the game. In fact, we're not saying that at all. But Tesla does need to make some improvements if it wants to keep from being squeezed out by its competition. First, it needs to get its manufacturing down. Truthfully, Tesla has a little while before it starts to see competitors en masse. Porsche won't start producing the Taycan until 2019. Many of Mercedes' models will come after 2020, likely the same with GM, too. There are some competing vehicles out now, but Tesla is still in the spotlight. To stay there, it will need to get its massive wait times down. While the company already trimmed those estimates, they need to come down even more. Also, Tesla has to do this while boosting quality. It doesn't do any good to increase production and churn out poorly constructed vehicles. Likewise, turnaround times need to improve for repairs. Some of the horror stories on these vehicles can be a real turn-off for potential buyers and something they wouldn't face when buying a Porsche or Mercedes. Tesla also needs to introduce its base Model 3 for $35,000 and it needs to do so without losing money. It makes sense why the company is building long-range, performance package and all-wheel drive Model 3s right now: They have the highest price tags and will help with cash flow. Becoming cash flow positive will be important for its next phase and allow Tesla more breathing room when it comes to ramping up production. CEO Elon Musk said earlier this month that the company has to complete its short-range battery first and that production of the base Model 3 should begin in early 2019. Finally, all of this has to come together toward profitability. If Tesla cannot operate its automotive segment for profit and positive cash flow, why is it more attractive than a low valuation, high profit, big yielding stock like GM, Daimler (DDAIF or Ford Motor Company (F - Get Report) ? Particularly at a time where others are moving forward with autonomous taxi fleets and electric vehicle offerings of their own. Without becoming more efficient on its production lines and without producing a profit, Tesla will struggle to introduce new products, like the Roadster and Model Y. It won't have the financial flexibility like its competition, nor will its lines be as effective. That's OK in the early goings when electric was not that popular. But with more automakers buying into the trend, it will be important for Tesla to continue leading. Tesla can not only survive, but actually thrive in tomorrow's auto market, but it needs to make improvements.